The Health Insurance TPA (third-party administrator) of India which has been set up to settle health insurance claims of state-owned general insurance companies has got necessary license from insurance regulator in India the Insurance Regulatory and Development Authority (IRDA). A licence is valid for 3 years from the date of issue. Further, it can be renewed for next 3 years, subject to regulatory satisfaction. 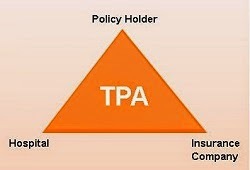 The Health Insurance TPA of India would start operations by April 2015. However, external TPAs will continue serving public sector general insurers and that about 50-55 per cent business would be there would remain with them, an official said. This common TPA will serve claim settlements of National Insurance Company, New India Assurance Company, United Insurance Company, Oriental Insurance Company and General Insurance Corporation of India as stakeholders. The first four insurers have 23.75 per cent stake each and GIC has five per cent.